Digital painting tutorial female hunter chief. In this tutorial, I will show you a step by step digital painting for a character that I did for a client. 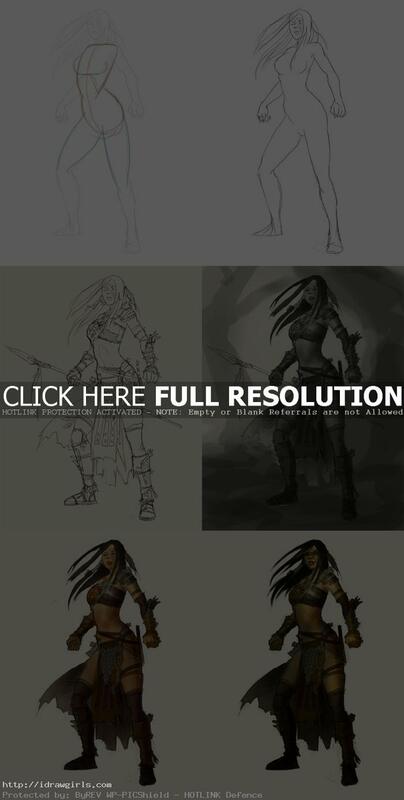 This is a step by step process of how to create a character for a fantasy type game. Usually you will receive description from client for each character concept illustration you will be working on. This character assignment, I have to design a tribal female hunter or warrior with lots of animal furs as clothing and spear. First I usually sketch it out using the description as a starting point. If the project is big and I have more free time, I will create a lot of thumbnail design. If not or if it is the subject I already familiar with, I will just dive right in. In this tutorial, I am going to show you the drawing and painting process of what I usually do for creature design. Again I would strongly recommend that you focus values first then the rest will follow. Thanks again for all the kind comments and support you guys and girls have for TheArtClasses.com (idrawgirls.com) I am glad this art tutorial blog helps out a lot of young artists. Below is a final illustration for the character. 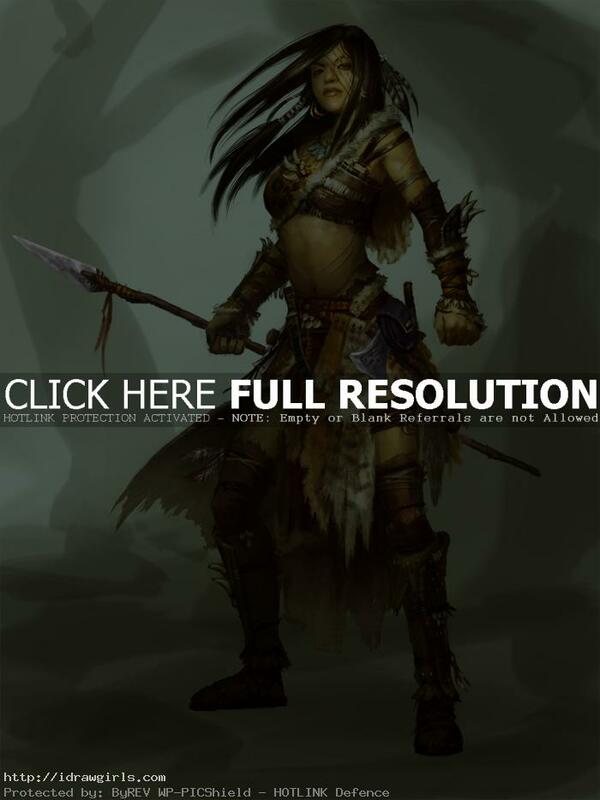 Below are step by step how to draw and paint a tribal female hunter. Step one, I sketch a basic female form a ready for any action pose. It is very similar to gesture drawing. Step two, I then refine her anatomy and muscle groups. Step three, I cover the basic body frame with costume. I find it is easier for me to draw a figure first then clothing on top. Step four, I then assign basic value by paint over the drawing with three values of gray. Step five, I just painted over it with selected color, but make sure not to alter the existing value. In this process, you can either use Overlay or Color function (mode) in Photoshop for quick fix. But in this I just use normal mode and paint with color. Step six, I paint detail on her face. In figure 7, I began to design and refine the costume and increase contrast in shadow. Step eight, I added more design then increased the lighting from the top right. The last step to do is just to paint detail on the rest of the image, but make sure I did not make any drastic change on the light and shadow I already set up. And done. Below are the drawing video demo art lesson how to start out drawing basic frame of a woman’s body or gesture drawing. This video contain only how to draw gesture, but not the full anatomy drawing. More drawing tutorials with videos. I am an artist too, i created oil painting from digital photos. This tutorial is very helpful! This is totally great! I like this work of art! And the tutorial lesson great, too! This effort of sharing this is highly appreciated. So useful craft for struglling artists like me.